Phil Kessel takes PPOTN honours after contributing two points in Pittsburgh’s win over Tampa Bay in Game 3 of the Eastern Conference Final. The right-winger scored his seventh goal of the playoffs in the Penguins 4-2 road triumph over the Lightning. STAT PACK: Kessel had one goal and one assist, recorded a game-high eight shots, blocked one shot and took 27 shifts in 19:09 of ice time. PHIL THE THRILL: “You look at the way that Phil's playing tonight and the way he used his speed, his shot, he creates so much,” said Sidney Crosby. 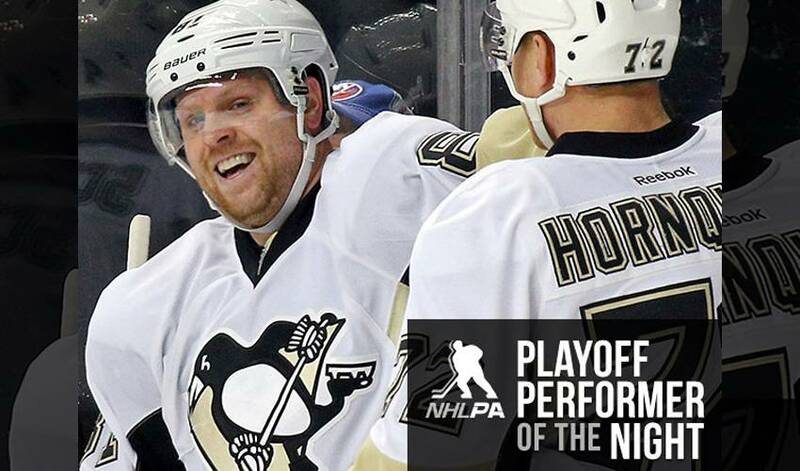 THREE’S COMPANY: Kessel now has 20-17-37 in 36 career playoff games (1.03 P/GP). Only two other active players, with a minimum of 20 appearances, have averaged more than one point per game during their postseason careers: teammates Crosby (1.15) and Malkin (1.06). LETHAL LINE: “The HBK Line” – the trio of Carl Hagelin (1-1-2), Nick Bonino (0-1-1) and Phil Kessel (1-1-2) – combined for 2-3-5 in Game 3. They have totaled 14-25-39 in 14 total games this postseason (Hagelin: 5-6-11, Bonino: 2-10-12, Kessel: 7-9-16). HIGH FIVE: Drafted fifth by Boston in 2006, other famous fifth overall picks include Jaromir Jagr, Scott Stevens, Bill Guerin and Carey Price. SISTER ACT: Kessel’s younger sister Amanda is a star with the U.S. women’s national ice hockey team. ARE YOU READY FOR SOME FOOTBALL? : Kessel’s father, Phil Sr., was a standout quarterback at Northern Michigan University. SHARING A DAY: Kessel shares a birthday with Mahatma Gandhi, singer Sting, TV show host Kelly Ripa and NBA player Tyson Chandler. HONOURABLE MENTIONS: Carl Hagelin had one goal and one assist. Sidney Crosby contributed one goal. Ondrej Palat recorded one tally and one assist for the Lightning, while teammate Nikita Kucherov had a pair of helpers.